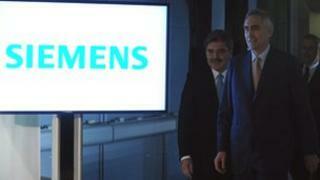 German industrial giant Siemens is to cut up to 15,000 jobs as part of a cost-cutting programme. It will cut about 4% of its 370,000-strong workforce but aims to avoid compulsory redundancies, according to a company spokesman. The firm will shed 5,000 jobs in Germany and another 10,000 jobs abroad. It comes after Siemens axed its former chief executive, Peter Loescher, earlier this year over falling profitability. Siemens and its unions have reached an agreement over about half of the job cuts and a deal on the other half will follow, the spokesman told news agencies. The firm has issued two warnings about profit margins during the last fiscal year, sending shares lower. Mr Loescher, led the company from 2007 and the Austrian was the first person recruited from outside the company to run the business.